Citation: C N Trueman "The Great Famine"
The Soviet Union’s ‘Great Famine’ between 1932 and 1933 may have resulted in the deaths of nine million people. The ‘Great Famine’ was a man-made affair and was introduced to attack a class of people – the peasants –who were simply not trusted byJoseph Stalin. There is little doubt that Joseph Stalin, the USSR’s leader, knew about this policy. He had once stated in front of others that given the opportunity he would have liked to have removed the whole Ukrainian peasant population of twenty million but that this was an impossible task. The ‘Great Famine’ – known as the ‘Holodomor’ (Hunger) in the Ukraine – was based on the fear Stalin had that the peasants simply could not be trusted to support his government in Moscow and uphold the revolutionary ideals of the Bolsheviks. Stalin ordered in to agricultural areas troops and the secret police, who took away what food they could find and simply left rural villages with none. Those who did not die of starvation were deported to the gulags. What happened was kept as a state secret within the USSR. This happened in the Ukraine, the Urals, to the Kazakhs – anywhere where there was a large peasant population. There is little doubt that the peasants of what was to become the USSR welcomed the revolutions of 1917. This does not mean that they were ideological supporters of Bolshevism, but that they recognised that the revolutions meant that the great land estates that existed at the time would be broken up and that they would benefit by becoming the new owners of that land. Very many peasants regardless of where they lived were conservative in their outlook. They believed that what they grew was theirs and that they could do with it what they pleased. A profitable year meant that more animals or seed could be purchased with the possibility of even more land. However, this did not fit in with the beliefs of either Lenin or Stalin. Fearing that the cities would be starved of food after the disaster of War Communism, Lenin introduced the New Economic Policy (NEP). However, to him it was only ever going to be a temporary measure. Lenin viewed the city workers as being the powerhouse of the Russian Revolution and on one occasion wrote “let the peasants starve” when it became clear that they had embraced what Lenin would have viewed as anti-Bolshevik beliefs – such as private land ownership, making profits etc. In 1927, the USSR faced a food shortage. This had been brought about by a poor harvest that year but Stalin became convinced that the peasants themselves were responsible for the grain shortages in the cities as a result of hoarding and keeping the market short of food thus increasing its price. He ordered thousands of young Communists from the cities to go to the countryside and seize grain. This was the start of a policy, known as the ‘Great Turn’ that left millions to starve. Stalin developed a win-win strategy. If a peasant handed over his surplus grain, the state would get what it wanted. Any who did not were labelled ‘kulaks’ and, therefore, were ‘enemies of the state’ and suitably punished – along with their grain being confiscated. The deportations started in 1930 but sparked off numerous localised rebellions. These were brutally suppressed by the NKVD, the forerunner of the KGB, and when it became clear that the peasants and the government were effectively at war, the peasants responded by slaughtering their animals (26 million cattle and 15 million horses) and destroying what grain they had. This confirmed in the mind of Stalin what he had long thought – that the peasants could not be trusted and that they had to be eradicated or brought to heel. This clash between Moscow and the agricultural regions occurred in the Ukraine, north Caucasus, the Volga, southern Russia and central Russian Asia. By December 1931, famine was rife throughout these regions. Nothing had been put in place by the government to help out those it affected. In fact, on June 6th, 1932, Stalin ordered that there should be “no deviation” regarding his policies. Stalin refused to recognise the enormity of what he was doing even to the Politburo. When he was challenged at one meeting to tell the truth, he told his accuser to become a writer so that he could continue writing fables. He even accused the head of the Bolsheviks in the Ukraine of being soft on peasants when this commander asked Stalin to provide his troops with more grain as they were starving. Throughout the whole era of the famine there is no evidence that Stalin was willing to change his policy by any degree. He even introduced the Misappropriation of Socialist Property Law – this stated that anyone caught stealing just one husk of grain was to be shot. Internal travel within the USSR was made all but impossible as the government had total control over the issuing of the internal passports that were needed to travel. 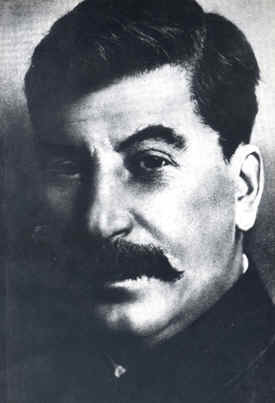 Stalin labelled the peasants ‘saboteurs’ who wanted to bring down the Soviet government. No one will ever know for sure how many died. However, it is generally accepted that within the Ukraine between 4 and 5 million died; one million died in Kazakhstan; another million in the north Caucasus and the Volga and two million in other regions. Over five million households were affected either by deportation, prison or executions. Stalin was later to admit to Winston Churchill that it had been a “terrible struggle” but that it was “absolutely necessary”.